September 2017 -- As we head into fall it's important to know what the real estate market looks like, especially if you're planning on buying or selling before the end of the year. While much of the country is experiencing a "hot" market, in favor of sellers, were seen a bit of the opposite of that here in Palm Desert. We are leaning more towards the buyers market, meaning there are plenty of homes on the market prices remain relatively low. There's only been a little over a 1% change from last year at this time. 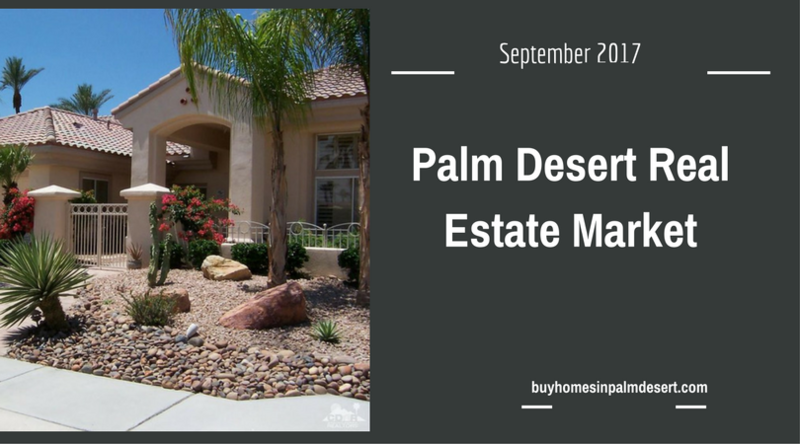 The average price for homes in Palm Desert is currently between $285,000 and $315,000. This covers all types of properties including vacant lots, manufactured homes, condominiums, townhouses and single-family properties. We predict a 3.5% increase over the next year so, what this means for buyers is that it's a good time to buy now because prices have increased too much and yet they will continue to increase more over the next year. Our median days on the market have actually increased just over a month ago and were about 11% higher than we were a year ago. The median days on the market are between 90 and 130 days. It's at this point that a professional, experienced and well seasoned real estate agent needs to price the home correctly from the beginning negotiate for the right terms. This is not a market that you can just throw anything up and price it however you want and have it sold in a week. This is a very delicate market and even though there are buyers out there, homes must be priced appropriately and presented accordingly. One good thing is that there are fewer properties on the market and there were a year ago and even just a month ago. Because we are coming out of summer are going to see fewer homes on the market throughout the winter but, were 19% down on our inventory from last year at this time even though prices were slightly higher. That's good news for sellers and buyers alike. Competition can balance itself out where there is a good number of properties for buyers to choose from and prices remain somewhat competitive. Sales over the last year have really been all over the board. We have slightly been increasing the number of sales since January of this year. There was a dip in November and December but since February, the number of sales has been gradually increasing. However, prices have been fluctuating a little more. The lowest price was a down at the beginning of April and the highest was at the beginning of June. It has since dropped to where we sit today, around $285,000 for the median sales price. For buyers and sellers, it really is a good market. While the sellers might not be getting top dollar, they can sell fairly quickly if the home is priced right. For buyers, there's plenty of inventory to choose from and a good margin in which to negotiate. Give me a call today if you have more questions about the Palm Desert real estate market or if you'd like to know what your home is currently worth questions on buying a property in the area.Palm Desert real estate market or if you'd like to know what your home is currently worth questions on buying a property in the area.